The journey into finding the perfect tank for your fish is not always clear cut. While sometimes you may want a tank that holds exactly 25 or 30 or 55 gallons, sometimes you want a range of options because you’re just not sure. 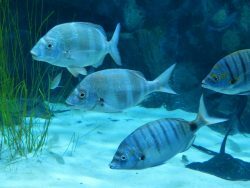 And it’s okay to not be sure when it comes to picking a definitive tank for your freshwater fish or saltwater fish (either tropical fish or marine fish). The range of 40 gallon fish tanks, somewhere between 35 gallons and 40 gallons is surprisingly diverse and full of a variety of options that can feel overwhelming. So, where do you turn first when it comes to finding the right tank in the 40 gallon fish tank range of options? Well you’re not going to be looking at exact gallon capacities. You’re going to be look at bigger picture items: overall shape, where can you place it, does it come with a filtration system, is safe for your active kids or pets? A size spectrum means you’re looking at more than just cut and dry capacity abilities of your tank. Though that is important and the first step in your decision making process, it’s not the only thing you need to look for when trying to decide which tank is going to be right for you. You’ll want to look at what kind of fish you’re keeping, whether they are saltwater or freshwater, whether the tank can handle either type of fish. You’ll want to see what’s included with the tank as many are combo kits but don’t come with everything you’ll need. This is especially true for the filters and heaters. And as far as the filter goes, you’ll want to make sure you monitor the power on the filter to keep your fish safe. For heaters, you will want to make sure it’s the right wattage and has built in thermometer and safety features. You can read more about heater options and safety in our aquarium heater buyers guide. 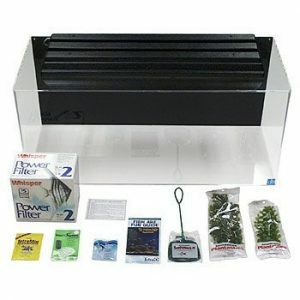 There’s two options with this 40 gallon fish tank kit and that’s the deluxe kit and the basic combo kit. For the deluxe you’re going to get a full hood with a 24 inch fluorescent light fixture installed though the bulbs are not included. Also included are a 40 gallon fish tanks filter, a starter guide, pebbles, and decorative items for the tank. Where the basic combo set is concerned you’re going to get the same basic items, minus the decorative additions. Both 40 gallon aquariums and measure 36 inches by 15 inches by 16 inches and weigh a moderate 20 pounds. They are constructed from lightweight, impact-resistant acrylic with more clarity than glass. Both the deluxe and basic kits are safe for freshwater fish or saltwater fish and are great options for a 40 gallon aquarium for beginners. The drawback for both these tanks boils down to the lack of inclusion of a bulb and lack of inclusion of some other items you’ll find in combo kits (like a heater and thermometer). It’s not hard to get these items yourself but it would be a nice addition, especially for a beginner who is not versed well in the needs and requirements of the tank. This 36 gallon aquarium is another one that has two options going for it. The first is simply the tank itself which is a nice cube design with a bit of modern flare that will fit on virtually any tabletop surface you could stick it on. It’s also got a bow front of the glass to bring clarity to the view inside the tank. 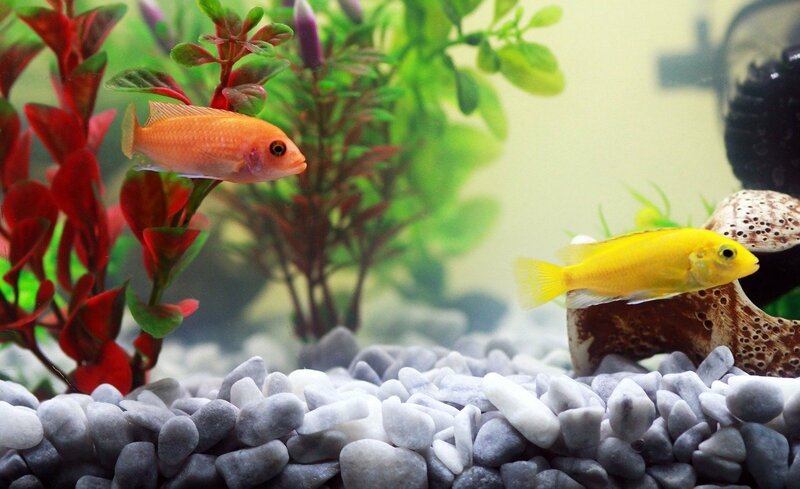 The 36 gallon fish tank itself measures 15 inches by 30 inches by 23.75 inches. The tank comes with Quiet Flow 30 Power filter, a submersible heater, and a deluxe full fluorescent light fixture. A white LED energy efficient lamp is included, with a slot for a second LED lamp of your choice. The only drawback is the filter is undersized for the size of this fish tank, however, you could always upgrade it yourself to a bigger one. 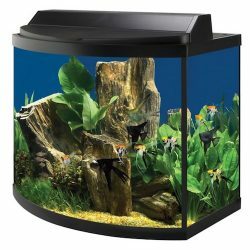 This is one of the more unique designed 36 gallon fish tanks we’ve seen so far on this list. It uses the traditional rectangular fish tank shape but implements some very flashy modern touches and bows the front of the tank to allow for maximum viewing and space for fish to roam freely inside the tank. This tank is 30 inches by 15 inches by 21 inches and weighs a moderate 20 pounds. So it’s perfect for moving around if you need some mobility on the tank. It’s constructed from strong acrylic, almost 20 times more resistance to chipping than glass and much clearer. This tank can house freshwater fish as well as saltwater fish. This tank doesn’t include any additional accessories which can be a drawback for beginners looking for an all-inclusive tank. There have also been sealing problems where the hood is concerned so you’ll want to monitor the seams and make of the tank before using it. This is easily the most uniquely designed tank on this list. 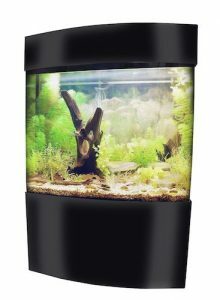 It’s a 40 gallon tall aquarium with a unique cylindrical design that also implements some elements of a rectangle and bow front aquarium, resulting in the best parts of all those tank models. It’s got a beautiful black, glossy finish which will make it a great décor piece. This tank measures 31.5 inches by 13 inches by 59 inches and weighs a heavier 45 pounds. It’s constructed out of strong, impact resistant acrylic on the tank itself. It includes this stand and canopy with a built in feeding tube for easy feeding times. It includes a 40 gallon aquarium filter system, a pump, a bio ball, and an air pump. The only downside here is the lack of further accessories and the possibility that you’ll have some trouble placing it since it’s a very unique design. But overall it’s a great buy for both functional and aesthetic purposes. This cylindrical 35 gallon fish tank, as the name suggests, utilizes a unique pentagonal design to ensure placement perfectly in the corner of any room in your home or office. It’s a stand alone tank with included stand and hood and offers a great view of the tank’s inner world. This tank measures 65 inches by 23 inches by 21 inches and weighs a heavy 80 pounds. It includes a three stage filtration system and aerator system as well. The base and hood are constructed from strong acrylic and the decorative plants inside are included in the purchase. You get a three sided view of the inside of the tank which is also a great bonus. The downside is the lack of further accessories and the lack of options for placement. This tank can only fit in the corner of a room so keep that in mind before purchasing it. This is a range of options across the 40 gallon fish tank for sale spectrum you’re looking for. 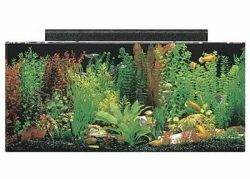 Within the large fish tanks for sale on this list, there are traditional designs, stand-alone designs, some tanks with deluxe or basic kit options, and some great beginner tanks and some better suited for veterans or intermediate hobbyists. 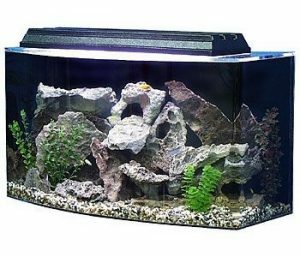 No matter which fish tank 40 gallon in size you’re looking for you’re likely going to find it on this list, and you can even use these tanks as a 40 gallon breeder aquarium if you are an experience aquarist. 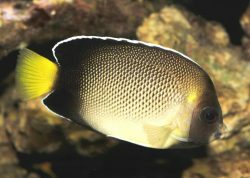 Keep in mind the warnings on each 35 to 40 gallon aquarium for sale and the suggestions at the beginning for what to look for in your own fish tank. And always remember to have fun! Let us know in the comments section if you have any experiences or questions and comments.